Last month, Google Maps went live with their Street View service for select cities in the UK, including Birmingham, Cambridge, London, and Oxford (see the announcement on Google's LatLong blog). This adds another dimension to our map of "The Life and Times of Henry Reed," and will hopefully allow for more accurate placemarking, since Google's street addresses are approximate, and often off by as much as a city block. The first thing I went looking for was Reed's London flat on Upper Montagu Street, where he lived from 1957 until his death in hospital, in 1986. Here's a small, interactive widgetclick the + sign to zoom, and the arrows to sidestepyou can even pop around the northwest corner to the chemist's, on Crawford Street! View The Life and Times of Henry Reed (1914-1986) in a larger map. See larger image on Flickr. The fact that the building is still extant is important, since it means that Reed stands a chance at one day getting his own memorial Blue Plaque from English Heritage, perhaps for the centenary anniversary of his birth, in 2014. Henry Reed died December 8th, 1986, in St. Charles Hospital, London. This December marks the twentieth anniversary of his death. This landmark makes Reed eligible for one of English Heritage's famous Blue Plaques, which adorn London landmarks once inhabited by eminent contibutors to the arts or industry. Some notable contemporaries of Reed's who have been awarded plaques include: Sir John Betjeman (31 Highgate West Hill), Sir Arthur Bliss (1 East Heath Road), Benjamin Britten, O.M. (173 Cromwell Road), C. Day-Lewis (6 Crooms Hill), T.S. Eliot, O.M. (3 Kensington Court Gardens), Louis MacNeice (52 Canonbury Park South), Dame Edith Sitwell (Greenhill, Hampstead High Street, Flat 42), and Dylan Thomas (54 Delancey Street). 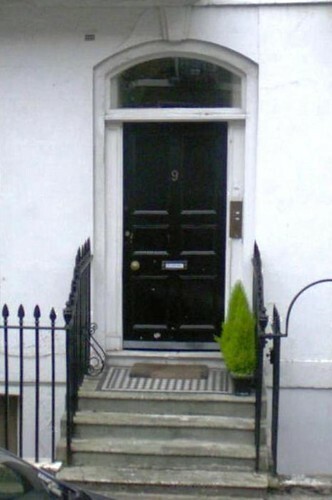 Reed lived on Upper Montagu Street, Marylebone, from 1950 until his death. To complete an application to propose a plaque, a photograph of the location is preferred. Any London shutterbugs out there want to earn a few PayPal pounds? Flickr? Anyone? There is good news, however. The Birmingham Civic Society already has plans to erect a Blue Plaque dedicated to Reed in their city during the centenary of his birth, in the year 2014 (see future plaques). W.H. Auden already has one (see this gallery of Blue Plaques in Birmingham). 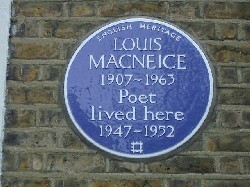 Also scheduled to receive plaques in Birmingham are Walter Allen (in 2011), and Louis MacNeice (2013). At any rate, on Friday, December 8th I'll be stopping down at the local pub after work, to honor Mr. Reed's memory with one his favorite pastimes: having a few drinks. I'm buying!